Posted March 25th, 2014 by & filed under Tour. Our April program and first tour of 2014 is one you won?t want to miss. First we will take a tour of Nancy Rascher?s garden at 545 Glenwood Trail, Elgin?at 10:00 AM.? ?Nancy is the daughter of Ginny Umberger, a long time Elgin resident who has tenderly loved and nurtured her land.? 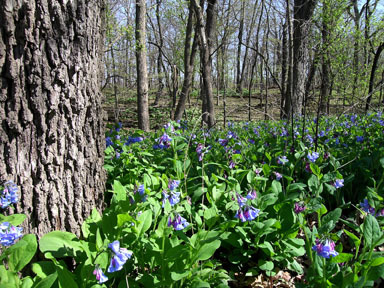 Nancy?s garden has many of the same features as Trout Park Nature Preserve including such rare shrubs as Leatherwood, which is found only in about 3 places in Illinois.? We will see many of the unusual tree and shrubs that also grow in Trout Park as well as many of the woodland spring ephemerals that we all love, twin flower, trout lily, bloodroot, blue phlox, Jacob’s Ladder, Rue Anemone, Wood Anemone, False Rue Anemone and Green Dragon. Like many of us, Ginny was initially a traditional gardener, and we will see many of the non natives that she planted growing with the many natives she encouraged to return to her yard. After our tour of Nancy?s garden (approx. 11 a.m.), will take a very short walk over to Trout Park where we are fortunate to have steward Sue Bohne take us on a tour of this wonderful site where we will see many uncommon shrubs and trees. Trout Park is located very near the junction of I-90 (Northwest Tollway) & Route 25 (Dundee Avenue) on the east side of Elgin. It features a nature preserve and steep wooded bluffs above the Fox River.? This rare natural community is termed a forested fen.? Uncommon species of plants and invertebrates that could not survive on the open prairie find a sanctuary here.? A fen is a special type of wetland. The water in a fen has a high pH level, unlike the acidity of a bog. Water seeps from the hillsides in Trout Park after flowing underground, passing through glacial deposits of limestone. This has caused the water to pick up many minerals, such as calcium carbonate, and become alkaline. Certain plants have adapted to this special growing condition.?? 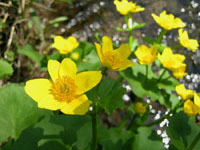 We will likely see a variety of plants, depending on the weather, like Trout Lilies, Hepatica, Skunk Cabbage, Bloodroot, Marsh Marigolds. You can park at Trout Park, but Sue tells us that the Little League teams practice there on Saturday morning, so you do run the risk of having your car hit by foul balls if you park in the parking lot there.